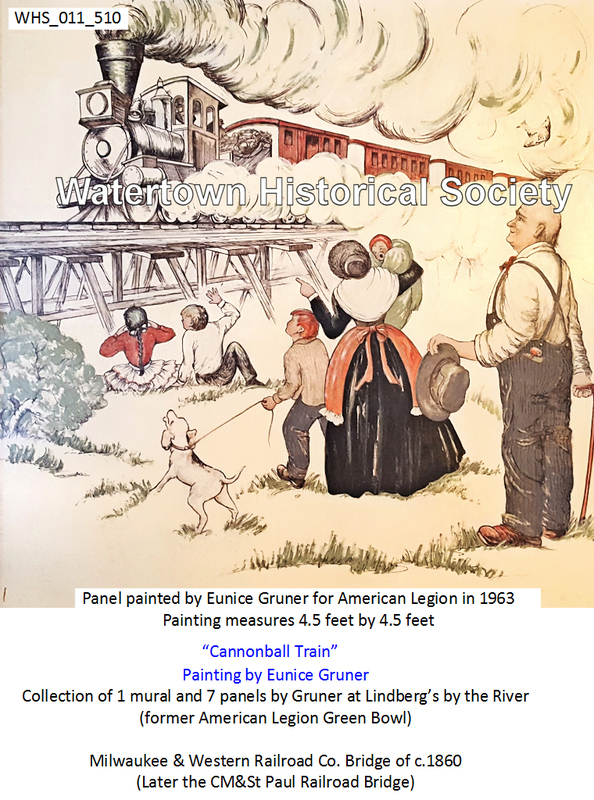 File on Railroad spur, North Water St.
Watertown's railroad history began during the administration of Theodore Prentiss. to cover the cost of constructing the Milwaukee-Watertown Railroad. M&StP 42, "D.A. Olin", Class H, was built by Niles & Co. in 1854 as Watertown & Baraboo Valley "Watertown". It became M&StP 42 in 1868. On April 11, 1899, it was renumbered 1438. It was scrapped on September 20, 1904. This engine featured Davis Balanced Valves, which were an early piston valve. Carl Schurz had ordered the preparation of what he considered a dream house for his Margarethe. He described the place to her as exposed to the loveliest view of their farm and the river and overlooking Water town in the distance. The rooms in the house were fairly spacious, very high, not without a certain elegance, and at the same time livable and homelike. The final selection of Watertown in 1855 by Carl Schurz must be considered one of the fatalities which came to Schurz occasionally to offset his good luck. On going there he had promised Margarethe that he would be most circumspect about investments, studying all conditions carefully in advance. This he doubtless did, but not without letting family interest and affection impart an unconscious bias to his reasoning concerning the facts. Otherwise he could hardly have fixed upon Watertown either for business or for politics. In September of 1855 Carl Schurz signed the papers which bound him to Watertown more firmly than he could have wished for in the future. The arguments in favor of this town were superficially convincing. Though small, it was at the moment the second largest town in Wisconsin, and it bade fair to become a railway center analogous to Indianapolis. Schurz through his recent interest in the Indiana capital may well have made that comparison. He had reported to Margarethe in 1854 from Indianapolis the striking fact that, at a given hour of the day, six trains would be seen moving out in different directions. Watertown was preparing for a like distinction, which of course had not been attained when he settled there. No railway as yet had reached Watertown in 1854. The Milwaukee and Watertown Railroad was within a few miles and the Rock River Railroad was pushing south toward Watertown. Still another railway was being built from the south. 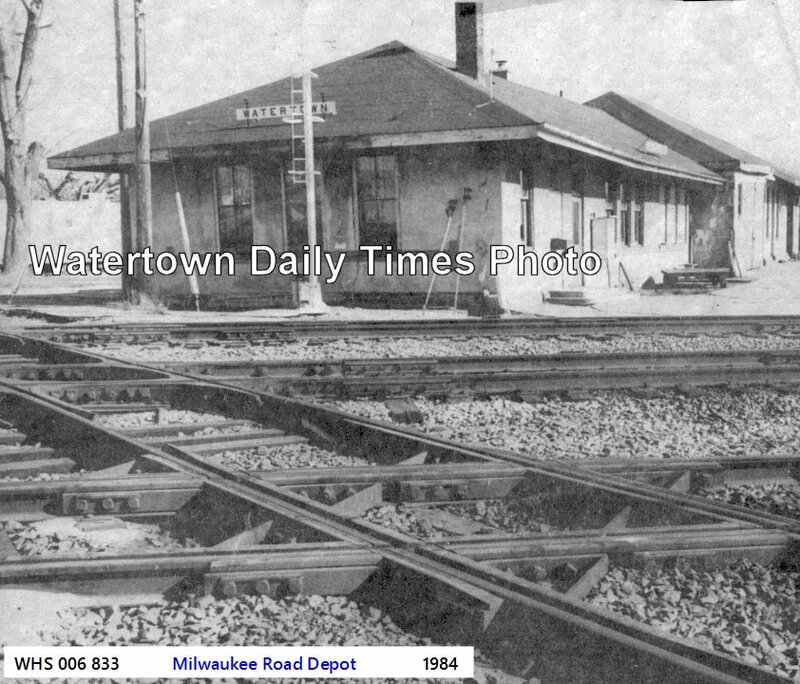 After reaching Watertown in September of 1856, the Milwaukee and Watertown branched. One division pushed toward Madison where it united with the Milwaukee and Mississippi, whose terminus was Prairie du Chien, the other pushed northwest toward La Crosse, to proceed thence to St. Paul. "All these railroads" wrote Schurz in August of 1856, "are called into being by immediate need, and therefore have good prospects." In November of 1855, the editor of the Milwaukee Daily Wisconsin pointed out that Watertown was likely to remain the terminus for a year. He was right in his prediction. If Schurz, as Margarethe had cautioned him to do, had investigated properly the evanescent character of western railway termini, he would probably have hesitated long before casting his fortunes with such a town. Western life had many things to teach him, but for its business lessons he was destined to pay dearly. . . .
08 11 With hardly an exception, uncompleted western railroads have been at a standstill for the eighteen months, but large gangs of men are now busy in our neighborhood in grading and laying the track upon two different roads leading through this place—the first running to the west, connecting Watertown with Madison, the state capitol, being an extension of the Milwaukee and Watertown Road, and the other completing the Chicago, St. Paul and Fond du Lac Road, between Janesville and the La Crosse junction. The Legislature of this state has conferred on railroad corporations certain privileges and franchises, which are intended to be mutually beneficial to both the public and these organizations. While it is the right of railroad companies to exact of those using their line the observance of indispensable rules and regulations, it is also the duty of railroad directors and agents to afford the public every facility which convenience and safety require. We know such to be the intention of the officers of the North Western Railroad, one of the most important railways in the West, but some conductors – though most of them are careful, courteous and gentlemanly – occasionally display a disregard of the claims of travelers which calls for immediate correction. 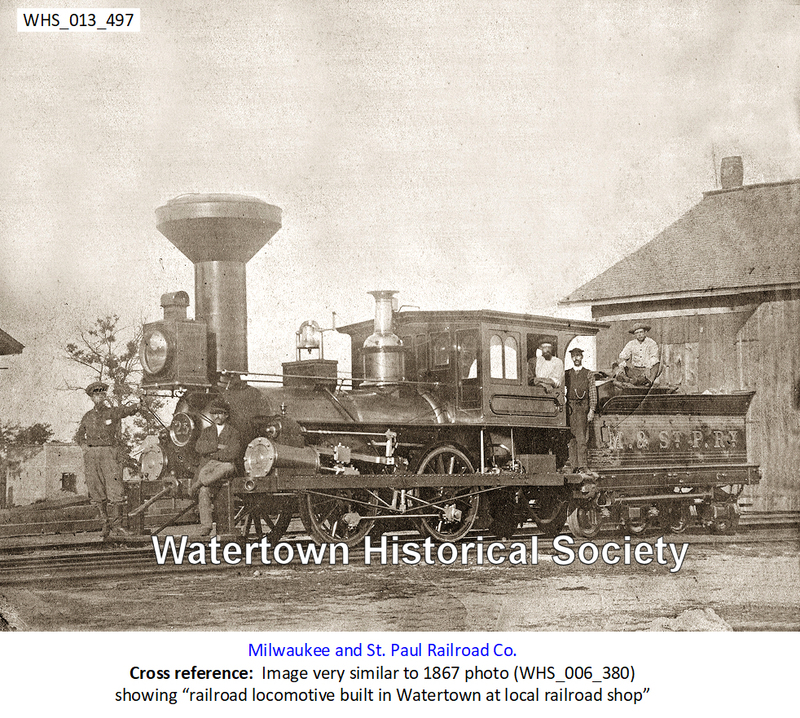 In the year of 1853 the City of Watertown loaned its credit to the Milwaukee and Watertown Railroad Company to the amount of two hundred thousand dollars and issued its bonds to said company for that sum. Said Company at the same time executed to said city its written agreement to pay the principal and interest of said bonds, as the same should become due and also endorsed on said bonds its guaranty of the payment of the same. Thus said Railroad Company became liable to the City of Watertown to save it harmless from the payment of said bonds and also on its guaranty to the holders of said bonds to pay the same. Since that time several changes have occurred in the affairs of said road; some time in the years 1856 or 7 it was sold out by its directors to the Milwaukee and La Crosse Railroad Company. Subsequently it was turned over by the La Crosse Company to other parties and called the Milwaukee, Watertown and Baraboo Valley Railroad; afterwards it again changed hands and was called the Milwaukee and Western Railroad; it is now owned and operated by the Milwaukee and St. Paul Railroad Company . . .
. . . It is a well-established principle that a mere change of name does not change or affect the liabilities of a Railroad Company . . .
. . . The Committee are of the opinion that the Milwaukee and St. Paul Railroad Company are liable to the City of Watertown to indemnify it against the holders of said bonds on the guaranty of payment endorsed thereon, in the same manner and to the same extent as the Milwaukee and Watertown Railroad Company were originally liable. Last Friday afternoon as the gravel train of the Milwaukee & St. Paul Railroad approached the end of the bridge on the west side of the river, going east, it came in contact with a loose flat car standing on the side track, which had by some means been put in motion, and three men employed on the gravel train were thrown under the wheels of the cars – two of whom were so badly injured that they have since died. The other, though seriously injured, is likely to recover. At Oconomowoc last Thursday evening, the 7th, a fatal accident occurred on the Milwaukee & St. Paul Railroad. 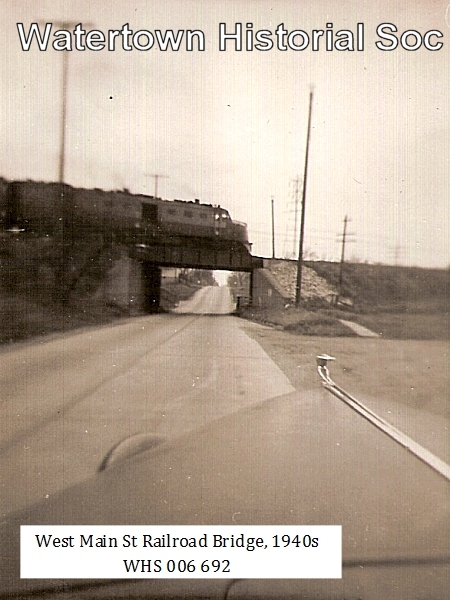 The Sun Prairie train had arrived at that village, and standing on the side track was a damaged freight car which had been ordered to this city [Watertown] for repairs. Mr. Charles H. Sanborn was acting as temporary conductor, in consequence of the illness of the regular conductor. The bumpers on the injured car had been knocked off, a fact unknown to Mr. Sanborn, and when he stepped in between the train and car to couple them together, he was crushed so quickly and severely that he survived his fatal injuries only about an hour. He was brought dead to his home in this city a few hours afterwards. He leaves a wife and two children to mourn this sudden and lamentable bereavement. Mr. Sanborn was a gentleman highly esteemed for his intelligence, industry, and integrity. His kindness and faithfulness had made him popular and respected by all with whom he was brought into business and social relations. While this startling calamity is an irreparable loss to his family, a large circle of friends and acquaintances deeply regret the death of one so well entitled to confidence and regard, and under circumstances, so painful and shocking. 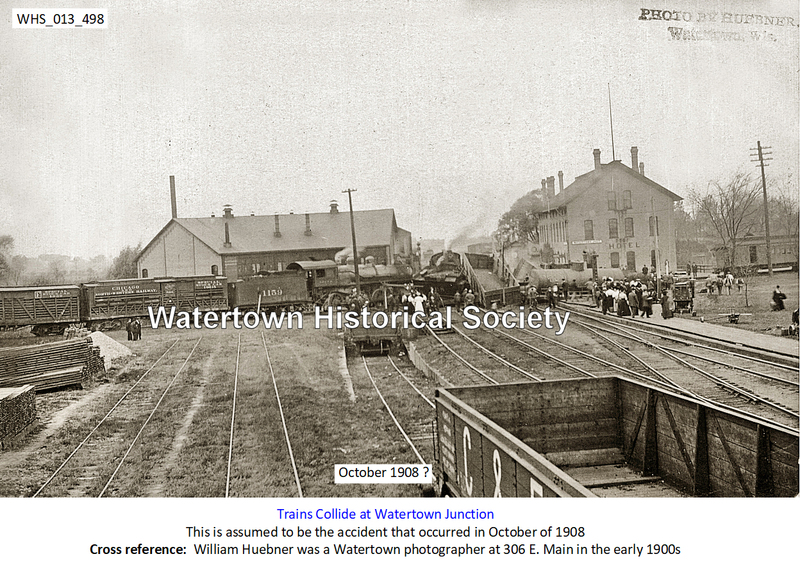 In 1866 the largest employer in Watertown was the St. Paul Railroad with 306 men on its payroll. About two-thirds of these employees worked in the train car repair shops until the company moved to Milwaukee in 1868 [ source ]. Railroad locomotive built in Watertown at local railroad shop, under the supervision of F. J. Hall, master mechanic. The Chicago and Northwestern Railway Company, heretofore a great consumer of wood in this section, are making arrangements for the use of coal on the entire line of road, and after this winter will purchase no more wood along the route. South of Janesville, we understand, they have adopted the use of coal altogether. The Jefferson county woods have been a source of great supply for the company and our timberland owners always had a most excellent customer in the Northwestern Railway Co., giving a great impetus to the wood market for many years past. Thousands of cords have been bought at Johnson's Creek, nine miles south of here, every year. The great demand about being cut off will have a tendency to bring down the price of wood with us, and our citizens may be prepared for lower figures in consequence. The increasing use of coal also with us will likewise have its effect on the wood market. All things considered, wood has been unreasonably high here for a long time, and the prospect of lower prices for this necessary commodity will be good news to many. Watertown is beautifully situated on both sides of Rock river, in the northern part of Jefferson county and the southern part of Dodge county. It is on the line of the La Crosse division of the C. M. & St. Paul Railway, 43 miles from Milwaukee and 152 from La Crosse. A branch of this line extends from Watertown to Madison, the Capitol of the state, distant 37 miles. The Chicago & North Western Railway passes through here, terminating at Green Bay, 112 miles north. Watertown was laid out about the year 1836. In 1840 a part of the town was laid out in blocks and town lots, Milo Jones of Fort Atkinson being the surveyor. After that the town took a fresh start, and the surrounding country began to settle up with farmers. The streets are laid out at right angles, and are broad and pleasant. One of the crowning glories of the city is the profusion of shrubbery everywhere prevalent, lining the streets on either side, and in the door [house] yards, forest and ornamental trees vie with each other in giving a home-like appearance, and in the spring and summer there is such a wilderness of foliage as to almost obscure the houses. The streets are well provided with substantial side-walks, usually kept in good repair, and afford many attractive promenades and drives. The principal streets are Main on the east, and West Avenue on the west of Rock river, upon either side of which are fine business houses and blocks, and many of them of beautiful design and finish. Madison City Directory, 1875-6. In the case of Francis V. Piper, vs. the Chicago, Milwaukee & St. Paul Railway company, a train ran into the plaintiff at a crossing one mile from Watertown. The train was running within the city limits at too high speed and did not whistle nor ring the bell. The question of whether the plaintiff was guilty of contributory negligence came up to the Supreme court, and it sustains the verdict of the lower court, giving the plaintiff $7,500 damages. Through the heroic action of Frank McLaughlin the life of a dissipated tramp was saved one night last week. Frank was attending the gates at the junction and on the approach of one of the night trains he noticed a man on the track with a newspaper over him a few feet from the train, and quick as a flash Frank bounded in front of the train , grabbed the man and rescued him just in the nick of time to save his life. The fellow had been drinking around town for several days and had evidently intended to commit suicide in this way. This is the second life that Frank has saved in Watertown, a few years since rescuing one of our now prominent young men from a watery grave in Rock river. For the time being, Frank is a hero of the hour in and around the Junction. 09 25 NEW CHICAGO TO WATERTOWN RAILROAD ? 01 16 Mayor Grube has been apprised of the recent death at Toledo, Ohio, of Elab W. Metcalf, who at one time held a good slice of the celebrated railroad bonds of this city. Aside from Ephraim Mariner, of Milwaukee, Mr. Metcalf was, we believe, the only bondholder who effected a settlement with this city and thus realized partially on his holdings. The train crew on the Fast Mail which goes through this city at a little after six o’clock in the morning discovered the mangled corpse of a man on the railroad track about a mile east of Richwood last Saturday morning and reported it to the section crew. The remains were taken in charge by the railway agent at Richwood, and were taken to the county cemetery at Juneau and buried. His remains were so badly cut up that identification was impossible and there was nothing on his person that would give any information as to his identity. He was evidently a stranger in these parts; his clothes indicated, however, that he had been doing work around a threshing machine, considerable chaff being on them. A special train of several coaches containing officials of the Pennsylvania railroad passed through this city Monday morning for the west. The run from here to Portage, including a slow up at the junction here and drawbridge at Portage, was made in 52 minutes. The distance is 48 miles, almost a mile per minute for the entire distance. 11 03 Watertown and other cities on the Janesville-Fond du Lac divisions of the Northwestern road are to have improved railway mail service. Official notice to this effect has just been received at Fond du Lac. Full railway post office service is to be installed on Chicago & Northwestern train No. 25 and 28. This will give full railway post office services on all the Fond du Lac-Janesville passenger trains. The time that the new order will take effect has not been announced. 02 24 William Reichert, residing on the Coffee Road, is still a great sufferer from the injuries he received in the accident at the Coffee Road crossing in this city a few weeks ago, when his rig was struck by a Milwaukee Road engine. It is understood that attorneys for the road have visited Mr. Reichert at his home on two occasions with a view of effecting a settlement. According to information obtained, the legal department of the road is awaiting the recovery of the gentleman before finally offering terms of settlement. It is also understood that if the offer is not satisfactory, the victim of the accident will bring suit for damages. The crossing is one of the most dangerous in the city and yet the city council keeps sides tracking the movement inaugurated a long time ago for better protection to the public. It would seem that this accident alone would be a warning of the danger in the several “death traps” in this city and definite action should be taken without any further delay. Engine was former C.M.&St.P RR 4-4-0, used on construction trains. A syphon hose is noted on the tender, used to take water from rivers and creeks. Concrete bridge abutments still exist on both sides of tracks, visible from the end of Terry Lane. 01 09 The Milwaukee Sentinel recently published the following item: "An appeal comes from the State Highway Engineer, A. R. Hirst, for competent foreman to take charge of road construction in Wisconsin. In the year 1912 about $1,000,000 worth of road work was done in the state under the general direction of the state highway commission, and during the coming year it is expected the amount of road work done will aggregate $2,500,000. Last year there was trouble in many counties to find competent foremen to direct the work and in 1913 this trouble promises to become acute. "We would like to bring out of the woods every man in the state who has had experience in handling men and tools in moving dirt or building city streets, country roads or railroads," says the state engineer in a letter requesting the assistance of The Sentinel in bringing this subject before the public. "We want men who have actually served as foremen on work of some importance and believe if we could secure a list of such men we could place most of them at very good wages and at the same time be of service to many counties which find it difficult to secure the right kind of men," he adds. It is the purpose of the Wisconsin Highway Commission to prepare a list of competent foremen which will be furnished to all county highway commissioners to assist them in the selection of men to have charge of their work during the coming year. If such a list can be secured it will solve one of the most serious problems facing the road builders in the state. 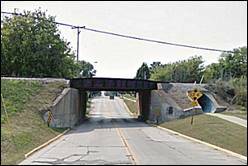 Northwestern and Milwaukee Road Men Injured. Both Have Had Narrow Escape. and Julius Lorenz of Portage is Bruised From Head to Foot. 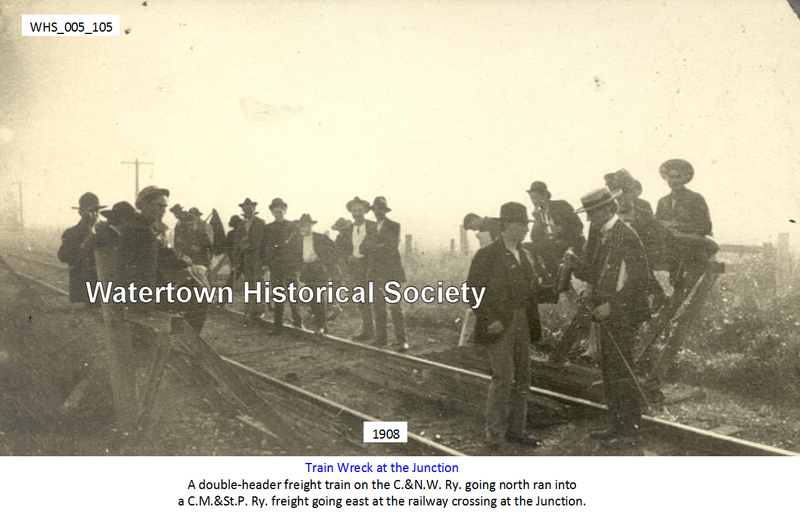 Two escapes from death, both miraculous, were experienced by railway conductors within a few miles of Watertown within about twelve hours. Freight Conductor R. C. Cook did what railroad men call “stepping into the air” on the short line of the Northwestern railroad near Clyman Junction Wednesday evening. His train was pulling into the Junction and after slowing down took up the slack with a jerk that broke it in two. Conductor Cook was on his way from the caboose to the head of the train, and stepped off one freight car just as the cars parted at that point. He is unable to explain how he managed to fall outside the rails. He fell so close to the car wheels that the tail of his coat was severed. The injured man was rushed to Watertown in a milk refrigerator car attached to the engine of the train of which he was conductor. 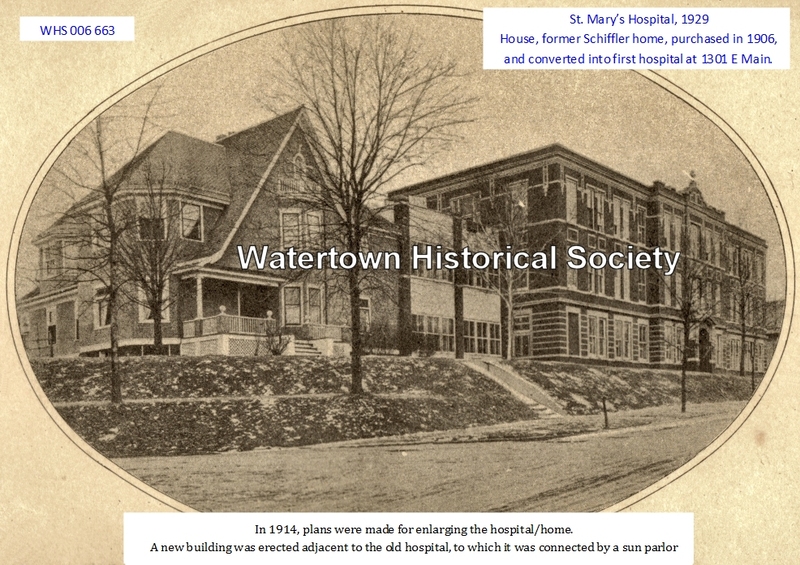 The special was met at the Northwestern depot by the city ambulance and Dr. F. C. Moulding, company physician, at about nine o’clock, and less than an hour after the accident, the conductor was being cared for in St. Mary’s hospital. His injuries consist of a broken ankle and many body bruises. 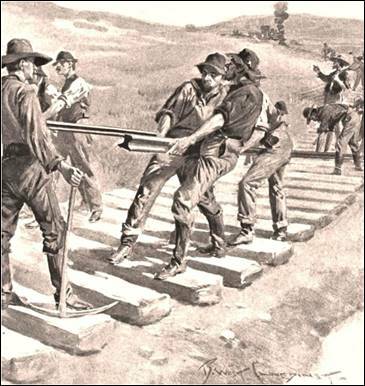 Railroad men declare that his escape from death is nothing short of miraculous. Conductor Julius Lawrenz of Portage was severely injured near Richwood when he fell from a motor car of which he was in charge. He was sitting on the front of the car and arose to make sure that there was no train coming around the curve. He lost his balance and fell in front of the car, which was going about ten miles an hour. The front wheels of the car, which weigh about 1,400 pounds, ran over Mr. Lawrenz before it was stopped. Though but two men were on the car with him at the time of the accident they were able to extricate him quickly and he was brought to Watertown on a train which was flagged for the purpose. The big toe on Mr. Lawrenz’s foot is nearly severed, and his body is a mass of bruises. It is believed that he has no internal injuries and that he will be able to leave the hospital on crutches and go to his home within a week or two. He was protected from serious injury from the car wheels by the fact that he is a large, muscular man, and wore a heavy coat. Any one walking on railroad tracks is subject to a fine or imprisonment or both, according to a law passed by the recent legislature. That information will be somewhat of a shock to those who are accustomed to country rambles via railroad tracks. It’s a fact however, according to Chapter 551, Laws of 1915. The maximum penalty is a $50 fine, imprisonment in jail for 30 days, or both fine and imprisonment. The law does not apply to railroad employees, newspaper reporters, and persons whose business with the railroad company requires them to use the tracks, like stock shippers, etc. There were more people killed and injured when trespassing last year than met death any other way on the railroads, and evidently this law was made to protect the railroad companies against suits for damages. 10 20 Milwaukee Road Depot began operations Oct 20, 1926. In the early 1960s, the old Watertown train roundhouse which housed the cars of the train companies was demolished. MILWAUKEE ROAD DEPOT served as a passenger and freight station until the “Cannonball” commuter train to Milwaukee was discontinued in 1972. Passenger trains which allowed residents to catch 30 different trains a day in the 1930s and 1940s have been gone since 1972. 03 28 The Chicago and North Western Transportation Company is considering abandonment of its east-west railroad track in Jefferson County and re-establishment of north-south rail connections through Watertown. Bob Milcik, C & NW assistant vice president of planning, said from his Chicago office that preliminary studies have indicated that service to Jefferson County could be handled most economically via the north-south line from Clyman Junction to Fort Atkinson. He said that the line from Jefferson through Watertown to Clyman had originally been planned for abandonment, but further study has shown it as the better route to serve Jefferson County. The north-south diamond at Watertown Junction was taken out several years ago, and Milcik said it would be rebuilt. He added that other improvements would have to be made on the track between Clyman and Jefferson junctions. After 58 years, the Milwaukee Road Depot closed when freight operations ended on March 15, 1984. The depot, which began operations Oct 20, 1926, served as a passenger and freight station until the “Cannonball” commuter train to Milwaukee was discontinued in 1972. 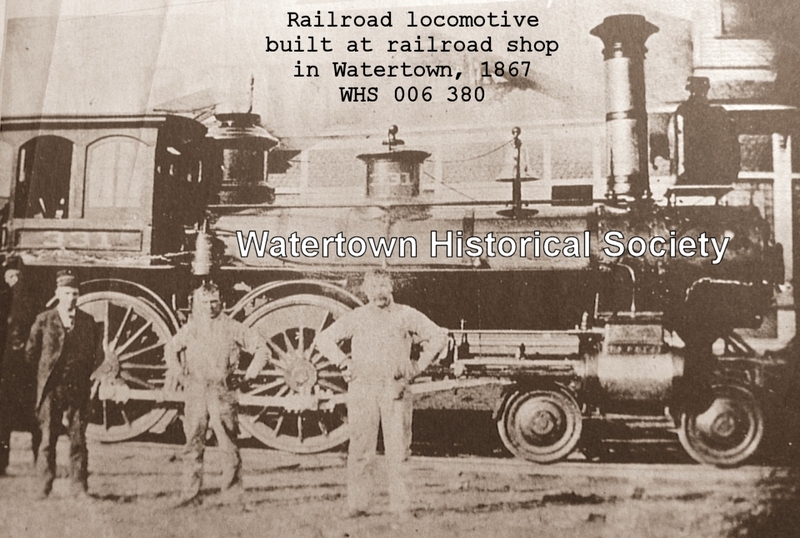 In 1855, modernization brought Watertown the railroad with an abundance of freight and passenger service. On March 15, modernization will cause the departure of the last of those services when the Milwaukee Road discontinues freight service in Watertown. Other eras have similarly ended over the past years. In the early 1960’s, the old Watertown train roundhouse which housed the cars of the train companies was demolished. The passenger trains which allowed residents to catch 30 different trains a day in the 1930’s and 1940’s have been gone since 1972. This most recent closing is part of an effort by Milwaukee Road to consolidate freight service around the state because of the changing market demands. Those who were served by the Watertown depot will be diverted to two stations. Customers of the depot west of Watertown will be served out of Portage, while those east of the city will receive service from Milwaukee. The L-shaped structure, opened Oct. 20, 1926, will be used as a maintenance office by track crews, signal maintainers and lineman. The facility will also be used for storage. freighthouse at the south end of Fifth Street. Soon after, railroad shops Nourished in the city until 1886 when a fire destroyed most of the facilities. But still the railroad business flourished. In 1863, a hotel was built at the depot’s present site to accomodate the crowds of railroad men and traveling public. In 1875 when the hotel burned down, a three-story Junction House was constructed. The building was not only a hotel and restaurant but also contained ticket and telegraph offices. That structure was also destroyed by fire in 1920. The roundhouse, which housed cars, engines and equipment was directly across the tracks from the Junction House tracks until it was abandoned and demolished approximately 15 years ago. Several depots operating in the city, including the impressive passenger structure at Fifth Street, were consolidated at the present depot location in 1926. Although freight service provided a livelihood to many Watertown residents, passenger service in the city was also extremely popular, especially in the mid-1900’s. Among the trains were the Milwaukee Road’s famed Pioneer Limiteds and Hiawathas, the latter providing the fastest land transportation in the 1930’s and 40’s. Passengers from the city could travel on the trains to as far west as Seattle via Minneapolis. Unfortunately, the local stop was discontinued in 1970 when Amtrak assumed the passenger carrying function. The final passenger service, “The Cannonball” commuter service, continued to operate until July 31, 1972, when it, too, was withdrawn from service. It marked the first time in 117 years that a depot in Watertown did not offer passenger service. Currently, about 24 freight trains pass the depot daily, of which four stop for service. Two Amtrak trains also pass through the city daily, but the closet Amtrak depot to Watertown is in Columbus. Legislators and residents attempted to revive the “Cannonball” in 1980, but after a two-week trial period, revival efforts faded. 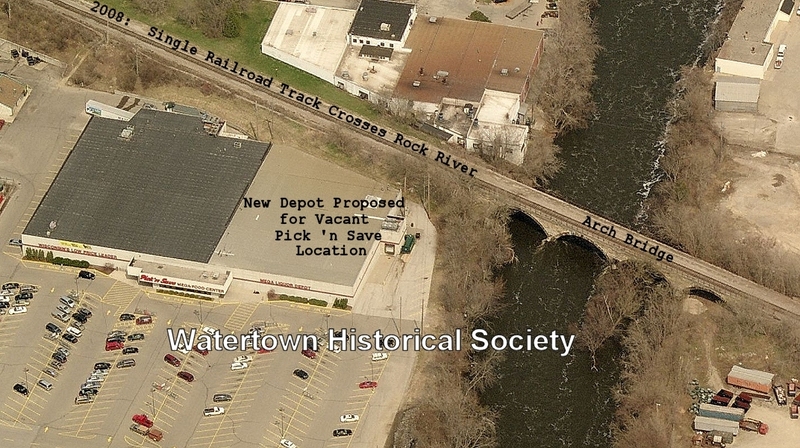 And with the closing of the freight depot, no trains, freight nor passenger, will stop in Watertown. Something that hasn’t happened in 128 years. 06 29 An estimated 150 people turned out at a public hearing on proposed high-speed passenger rail Thursday night, and those who commented on the plan represented communities all along the Milwaukee-Madison corridor, where the trains would run. Residents at the hearing on the environmental study for the proposed project provided a range of comments on the proposed 85 mile passenger rail system proposed by the Department of Transportation and Amtrak. Supporters and opponents spoke throughout the hearing at Riverside Middle School. Some opponents criticized the environmental study, recently completed by the DOT. Supporters said passenger rail would be a good mode of transportation, among other things. 11 20 Canadian Pacific Railway, which operates the main railroad line through Watertown, has sold a 32.5mile line of track from Madison to Watertown to the Wisconsin & Southern Railroad. Years ago the route was a bustling line which carried passengers and freight between Madison and the main line of The Milwaukee Road. The line connects with the Canadian Pacific Main Line and the Union Pacific line at the railroad intersection just west of the Montgomery Street rail crossing. Wisconsin & Southern, a privately owned railroad based in Milwaukee, had leased this line, known as the Waterloo Spur, from Canadian Pacific in 1998 and exercised an option granted then to purchase it. 06 18 Dedicated train enthusiasts were rewarded by the appearance of a vintage steam engine train which made its way through town Sunday evening. Running behind schedule, the locomotive eventually rolled through the area pulling several old passenger cars, including the unique Milwaukee Road Hiawatha Sky Top observation car. Built in 1944, the steam engine, dubbed No. 261 by Milwaukee Road, has been made available for several excursions by employees of Canadian Pacific Railway and their guests. The engine was restored in the early 1990s and is the only operational engine left of the 10 originally built by the American Locomotive Company for the former rail line. 12 10 As the train of Christmas lights rolled into town thousands of area citizens flowed in, surrounding the train to stand in the rain and watch the entertainment. To see the attraction up close, viewers were requested to donate at least one nonperishable food item to the Watertown Food Pantry. "Even with all the lights on the train it was still really hard to see everyone in the crowd, but there must have been 2,000 to 3,000 people there," Glenn Rabenhorst, pantry president said. Teenagers from the Recreation Outreach Center youth organization circulated through the audience during the program with boxes to collect food items. And after the music was over and the train slowly pulled away residents continued to donate food. Watertown residents may soon be able to hop on an Amtrak train in the city and travel to Madison, Milwaukee or Chicago — but that scenario all depends on the passage of Senate Bill 294. The bill, which is also known as the Passenger Rail Investment and Improvement Act of 2007, was proposed by Sens. Frank Lautenberg and Trent Lott in January and would provide $12 billion in federal funding for nationwide Amtrak services over the next six years. The proposed 85-mile route between Madison and Milwaukee would include stops in Watertown, Oconomowoc and Brookfield, with trains traveling up to 110 mph, according to Randy Wade, passenger rail manager for the state Department of Transportation. He added a trip from Madison to Milwaukee would take roughly 70 minutes. Wade said it will cost between $300 and $400 million to extend the Amtrak Hiawatha Service from Madison to Milwaukee and that under the proposed bill 80 percent of the funds would be provided by the federal government, while the remaining 20 percent would be covered with state funds. Watertown would realize as much as $10 million to $15 million in economic benefits if a passenger rail service is expanded to the city, according to a report issued this month by the Midwest Regional Rail Initiative. The rail initiative proposes an 85mile route expansion from Madison and Milwaukee that would include stops in Watertown, Oconomowoc and Brookfield. The trains would travel up to 110 mph, making a trip from Madison to Milwaukee take about 70 minutes. According to the report issued by nine states participating in the initiative, the passenger rail service would generate $23.1 billion in user benefits from time savings, congestion relief and emission reductions during the first 40 years of the project. The nine states participating in the initiative include Wisconsin, Ohio, Nebraska, Missouri, Minnesota, Michigan, Iowa, Indiana and Illinois. 07 23 The Wisconsin & Southern Railroad Company services 1,400 communities in the state. The city of Horicon is the hub of operations in Dodge County as it is home to the locomotive repair operations, paint shop and switching system. A resolution asking for a second daily Amtrak train between Chicago and the Twin Cities, Minn., will be on the agenda of the Watertown Common Council when it meets Tuesday at 7 p.m. in the council chambers of the municipal building. Because gas prices are not expected to decrease anytime soon, the council will look to take action on this resolution making the additional train request to Amtrak, members of the U.S. House of Representatives, U.S. Senate and the governors and state legislators of Wisconsin and Minnesota. The resolution calls for the second train to become operational in the first quarter of 2009. The return of passenger train service in Watertown, for decades just a dream of area residents, has become a real possibility now that the federal $787 billion stimulus bill has been signed into law. The legislation includes $8 billion for high-speed rail, the exact kind of project that has been proposed in the Midwest Regional Rail Initiative. That initiative would greatly expand rail service in the Midwest, including the expansion of passenger service from Milwaukee to Watertown and on to Madison. Some of the train service would include a stop in Oconomowoc and some would have the Watertown stop, according to earlier information on the expansion. Vacant Pick ‘n Save store proposed as site for new high-speed train depot, adjacent to historic arch railroad bridge. 12 09 $1.2 billion in high-speed rail money being taken away from Ohio and Wisconsin and awarded to projects in other states. Governor-elect Scott Walker had vowed to kill the planned 110-mph Milwaukee-to-Madison passenger train route that was to be funded with Wisconsin's share of $8 billion in federal stimulus dollars. Ohio Governor-elect John Kasich had issued a similar promise for a planned 79-mph line connecting his state's three largest cities, funded by $400 million in stimulus cash. In a meeting with reporters in Pewaukee, Walker called the decision a "victory" because he sees the rail line as a symbol of excessive government spending. Outgoing Democratic Gov. Jim Doyle had suggested Walker's stand also would jeopardize a separate $12 million grant for upgrades to a Hiawatha crossing and the Mitchell International Airport station platform, but the federal announcement made no mention of withdrawing that money. Doyle called the loss of the high-speed rail funds a "tragic moment for the state of Wisconsin." U.S. Transportation Secretary Ray LaHood this week sounded the death knell for the high-speed rail project in Wisconsin in an announcement that was a surprise to hardly anyone. Gov.-elect Scott Walker made stopping the train project a major plank in his election campaign and he based that vehement opposition to the project on the estimated $7.5 million annual state subsidy the train was expected to have. We have been strong supporters of the extension of the Hiawatha line from Milwaukee through Watertown and on to Madison as the first step in a broader plan to extend the service to Minneapolis-St. Paul. This line would have also been the first of many which would have comprised the Midwest Regional Rail Initiative, connecting a number of larger cities in the Midwest. We strongly believe the train extension would have stimulated the economy of Watertown and others along the line and near it. Not only would it have been another option for travelers who don’t want or are unable to use the increasingly congested highways, but it would have improved freight service dramatically. But, now those hopes are all history. The train is dead and the opportunities are lost. And, it’s likely they will be lost for a long, long time. No one knows for sure just how big the impact of the expanded service would have been but suffice it to say it won’t be long before many who opposed the train will change their thinking. A more robust economy will certainly put more pressure on higher gas prices and that in turn will have people longing for transportation options other than their personal car. And, over time industries will look for more options in shipping and receiving goods from long distances. The train would be a solid option. Still, the world isn’t ending. We’ll move ahead as a community with or without the train. Certainly the Highway 26 bypass of Watertown, currently under construction, will have a positive economic impact on the community when it’s completed over the next couple of years. It’s just too bad the debate on the high-speed line was framed simply on the $7.5 million operating subsidy and not on economic potential. Had the economic impact been the issue, we suspect the outcome would have been different. Cross Reference: Mayor Ron Krueger stands where a proposed train station was to be built. “I was home when it happened about 150 yards to my south. Tanker car derailment west of Montgomery Street crossing a little after 2 p.m. Thirteen cars left the tracks at and near the intersection of the Canadian Pacific mainline and the Union Pacific branch line. The 110-car train was bound for Chicago, with 109 of those cars carrying crude oil. Canadian Pacific Railway says a broken rail caused the derailment. Canadian Pacific Railway Holiday Train, Watertown Whistle Stop. 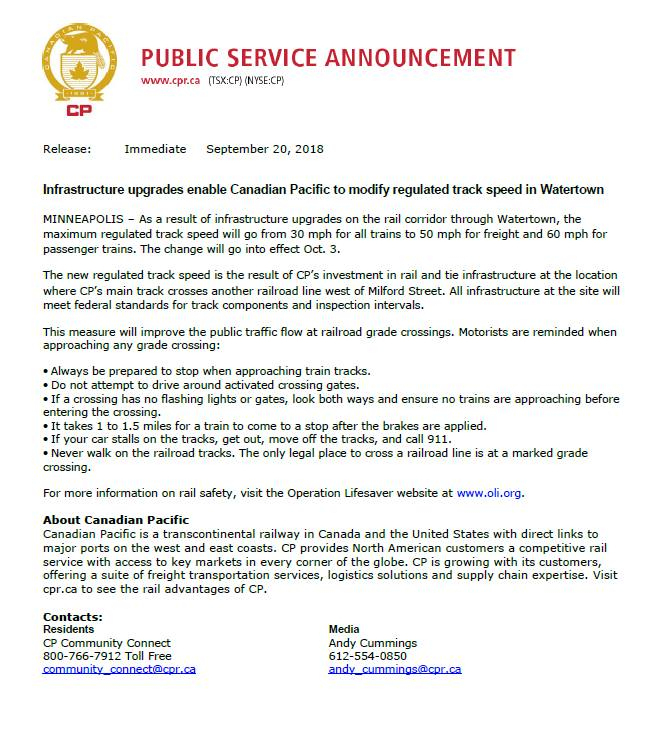 Trains passing through Watertown will be moving much faster starting on Oct. 3, according to an announcement by the Canadian Pacific Railroad. Starting on Oct. 3, freight trains will have a maximum speed of 50 miles per hour and Amtrak trains will have a maximum speed of 60 miles per hour. This is a substantial increase from the 30 mile per hour speed limit for both passenger and freight trains which is currently in effect. The new higher speed limits are the result of CP Rail’s investment in rail and tie infrastructure at the location where the railroad’s main track crosses with the Union Pacific tracks west of Milford Street. Glenn Oestreich (1952–2009) Watertown railroad buff. Portion of photo collection donated.